We consider ourselves very privileged at Marsden Barn to bring you the Woodford Trailer range. 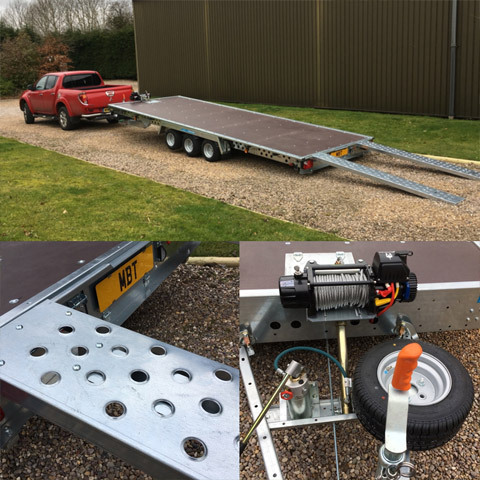 These high quality trailers are designed and built in Northamptonshire by Ian and Jolanta along with their team of dedicated professionals. 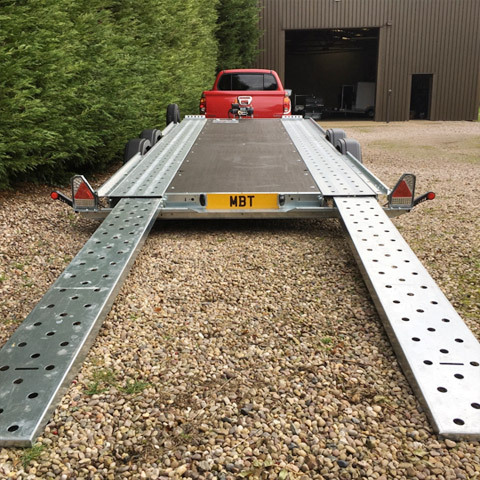 From Smart Car trailers that tow behind your Motor Home to the top of the range Galaxy Covered Car Transporter, we can supply a Woodford trailer that will surpass the expectations of any private, club or Pro motorsport customer. With such an impressive range available and a list of great value extras that can be added to enhance your trailer even further, your vehicle moving requirements will be easily exceeded. The build quality and longevity of these trailers really does make them the No 1 choice for vehicle transport and with over 20 years of trading and a long list of satisfied and repeat customers, you can also be assured that the Woodford after sales care, just like our own, is second to none. At Marsden Barn we carry stock of the most popular models from the Woodford range so that we can meet any urgent needs that our customers have. If the models we stock don’t match your exact requirements I would recommend that you still pay us a visit to see the superb build quality of these trailers and experience 1st hand why they have such an excellent reputation. We can then talk through your needs and, if appropriate, place an order direct with the factory. 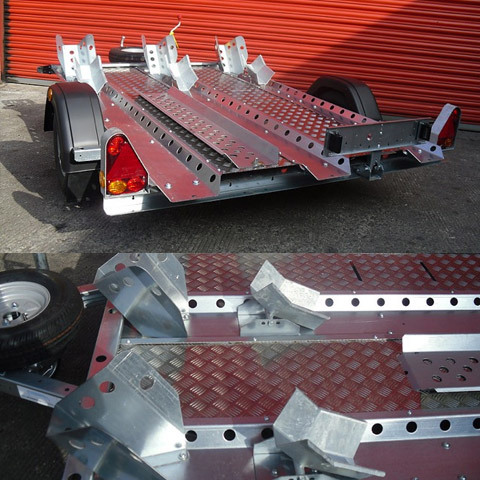 Please do get in touch with your requirements so that we can help to match you with your perfect trailer. Please click here to view the Complete Price List & Options. The RL7000 is a high quality covered trailer. It is suitable for moving and storing large vehicles, with a generous interior space to stow all those necessary extras like spares and equipment, safely and securely. Like the Galaxy, the RL7000 is slightly taller than the RL6000 allowing even more height clearance for tall vehicles. It comes with a hydraulic tilt bed for a great loading. Available in Tri axle with optional extras such as shock absorbers, winches and alloy wheels. Expertly designed to provide the maximum space. There is no intrusion from the wheels underneath, a large useable floor space wall to wall with full length mounting points and excellent headroom. 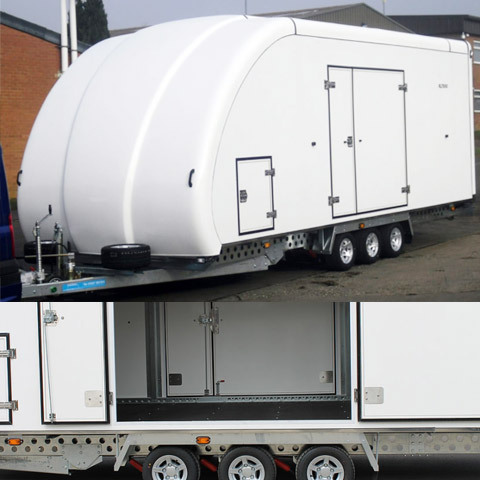 The trailer has a useable internal bed of 20′ in length with a choice of 7′ or 7’8” wide versions. The large full width, drop down rear ramp door is gas strut assisted with stainless steel reinforcement and allows for a great loading angle. The maximum payload limit is 2080kg and the gross (load plus vehicle carried) is 3500kg. The RL6000 is a high quality covered trailer. It is suitable for moving and storing large and small vehicles, with a generous interior space to stow all those necessary extras like spares and equipment, safely and securely. It comes with a hydraulic tilt bed for a great loading angle and our RL6000’s come fitted with a huge 12000lb wireless remote control electric winch. Now available in twin or Tri axle options with optional shock absorbers. The trailer has a useable internal bed of 18′ in length with a choice of 7′ or 7’8” wide versions. The large full width, drop down type rear ramp door is gas strut assisted with stainless steel reinforcement and allows for a great loading angle. The maximum payload limit is 2170kg and the gross (load plus vehicle carried) is 3500kg. The RL5000 is a high quality covered trailer. 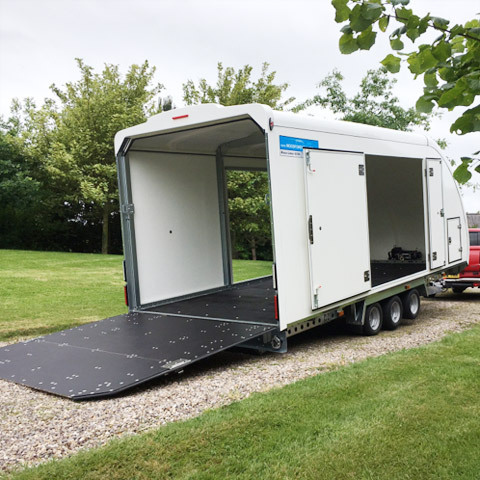 This trailer is very popular for race events and track days where vehicles and equipment are being shuttled to and from the track and where generous interior covered space, good access from all sides and easy loading and unloading are of paramount importance. 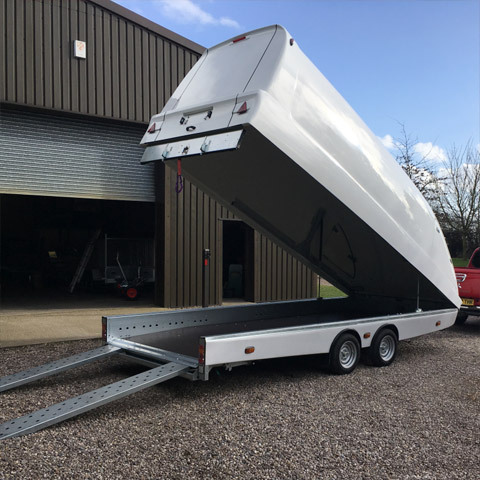 All RL5000 covered trailer models feature a full width drop down rear ramp that is gas strut assisted, reinforced with stainless steel and double locked for additional security. The RL5000 has 2 large lockable gullwing doors as well as two locking front access hatches as standard. The gullwing doors and access hatches are all keyed alike so no more fiddling with different keys. It features a low interior bed that is available in 2 widths, either 6′ 3" or 6′ 11". The useable bed length is 16 ‘. Payloads ranging from 1560kg to 2340kg are available with gross weights of 2600kg, 3000kg and 3500kg on offer. Comes complete with internal and external LED lights. The RL2000 trailer is the smallest in the covered range. 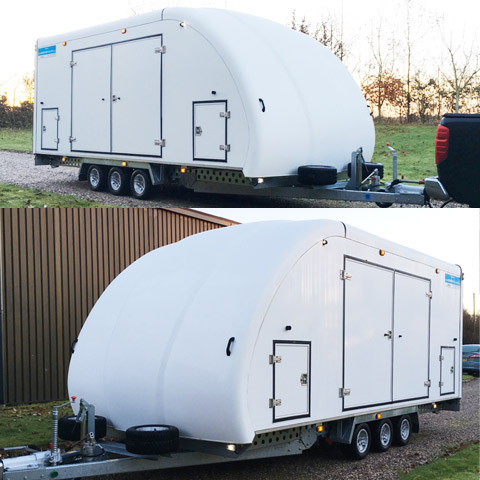 This is a low profile and compact high quality covered trailer. 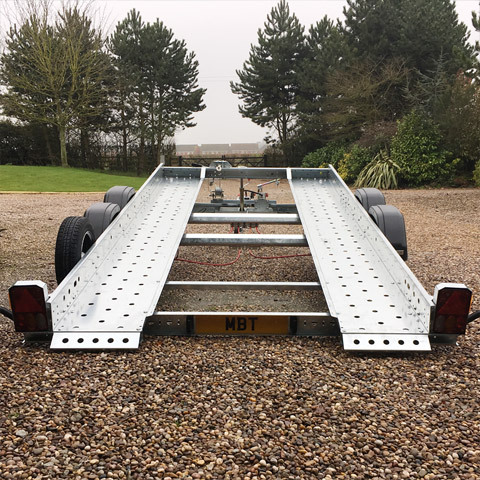 The RL2000 trailer is suitable for smaller vehicles, which are loaded via two pull out metal ramps. It has a powerful gas strut lift for ease of opening and closing. The load limit is 1680kg and the gross (load plus vehicle carried) is 2600kg. Internal length is 12′ by width of 6′ 3.5". Woodford’s flatbed trailers are ideal not only to transport cars but also tractors, diggers and numerous other types of plant. They come with many optional extras such as a tilt bed, formed ramps, winches (manual or electric), LED lights, ladders racks, tyre rack, centre deck storage and the list goes on! Wide body trailers are ideal for wide low ground clearance cars. These trailers come complete with pull out ramps and they have a very low loading height. Options such as a tilt bed are available on models from 14’ upwards and a winch and LED lights are available as options on all sizes. 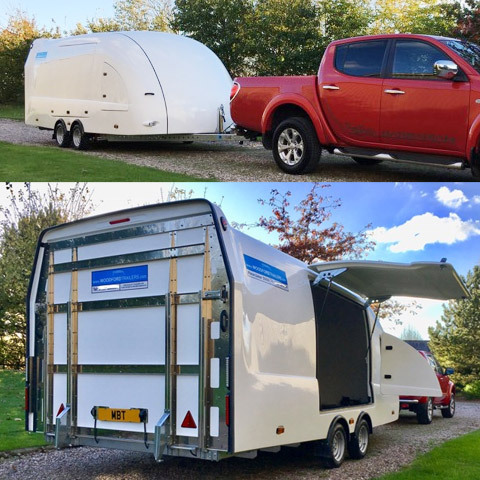 The smaller single axle versions of this trailer are very popular with motorhome users for towing smart cars or similar behind their motorhome. 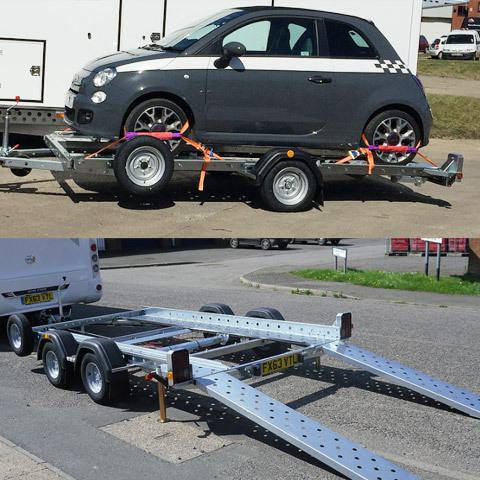 These car trailers can carry a wide range of vehicles up to 2800kg. The ramps pull out from under the runways and are available with tilt and tilt with ramp options as optional extras. There is also a model within this range that offers a tilt bed with no ramps which is ideal for users who have very little room to load their vehicle and wish to drive straight on. As you would expect, there are loads of extras available such as tyre racks, LED lights and winches. This Woodford Three bike trailer is wholly manufactured in the UK. 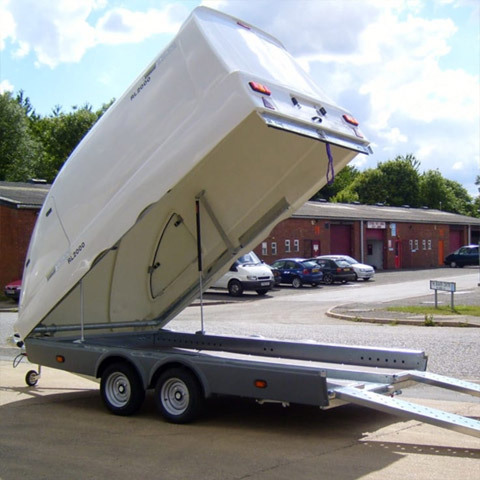 As standard the trailer comes with a spare wheel, locking hitch, a sturdy wheel chock system and loading ramp. The small, smart design allows a vehicle to tow either one, two or three bikes safely. Extra ramps can be purchased if required.